Let us now appreciate Paul Ryan’s utter failure as a political leader. As he gave his brief press conference Friday afternoon confirming that Republicans had pulled their bill to repeal and replace the Affordable Care Act, House Speaker Paul Ryan both looked and sounded like a hangdog high school football coach spilling out a few defeated platitudes after watching his team get ground into the turf. In a sense, Ryan was being too easy on himself. Yes, “doing big things” is difficult in Washington. The Capitol dome is practically designed to bottle up and suffocate dramatic change. But whatever growing pains they may have experienced, fractious Democrats still managed to execute an ambitious agenda in the early Obama years without a major legislative collapse the likes of which we all witnessed this week. The rollout of the American Health Care Act, by contrast, was a mystifying debacle. And as much as anything, its demise is an indictment of Paul Ryan that should shatter what’s left of his myth as competent policy thinker or political leader. Aside from the occasional PowerPoint, it’s really not clear what the man is good for. Journalists often describe Ryan as a “wonk”—or if you’re CNN, a “legendary wonk“—mostly because he has sold himself as one. It’s Ryan’s #brand, which he’s nurtured with a stream of lofty white papers and interviews with credulous reporters. But in truth, he’s always been far better at playing a policy nerd on TV than at doing the hard work of crafting legislation that could ever conceivably pass Congress or be implemented without causing mass havoc to the poor. First and foremost, the man is an ideologue who can competently dress up his Randian fantasies with some numbers, and an occasional magic asterisk where key details should be. That became painfully obvious with the AHCA, a nonsensical piece of legislation that despite his lame attempt to sell it with a slide deck presentation, somehow achieved the distinction of being panned by policy experts from the left, right, and center, without actually attracting the support that a normal, if unsatisfying, political compromise might. Ryan initially took Obamacare’s basic structure, then defunded the things that made it work in order to pay for massive tax cuts. The bill only became more preposterous and unworkable as Ryan and the White House bargained away necessary regulations for support from hardliners. Now, it’s possible this is not truly a reflection on Ryan’s aptitude as a policy thinker; the inherent contradictions of the Republican Party may have made it impossible for anybody in leadership to craft a coherent health reform bill. But then, after making last minute changes that would have fundamentally reshaped the entire individual insurance market, the speaker attempted to bring it to a floor vote Friday without any kind of score from Congressional Budget Office. The man pushed legislation with little to no clue as to what it would actually do to the country. Generally speaking, wonks care about that sort of thing. So Paul Ryan’s reputation as a policy mastermind has finally been shown to be a myth. What about his leadership skills? They appear to be nonexistent. From the start, his entire strategy of pursuing health care as an early, quick win for Republicans never made much sense. Ryan argued that it was necessary in order to prep the runway for tax reform easier later on, since nixing the various taxes that fund Obamacare now would allow the GOP to cut rates deeper in a second tax bill while keeping it revenue neutral, and thus allowing it to pass as a permanent bill rather than one that expires after 10 years. But that was entirely predicated on the idea that health reform was actually doable. Back on planet earth, where the American Health Care Act was a disaster in waiting, doing taxes first, and maybe settling for a slightly higher capital gains rate, would have made far more sense. A man who had any sense of his own caucus’s limitations might have actually accepted that reality. It’s also crystal clear that Ryan no longer has sway as an intellectual leader among conservatives. This was his chief qualification for becoming speaker, mind you: He was a star of the mainstream GOP who had the ideological credibility to bring along recalcitrant hardliners in the House Freedom Caucus. That was always a little bit of a dubious theory—off the bat, Ryan had to retract some of his demands he’d floated before taking the job after meeting resistance from the Freedom Caucus. And now it’s been totally debunked. 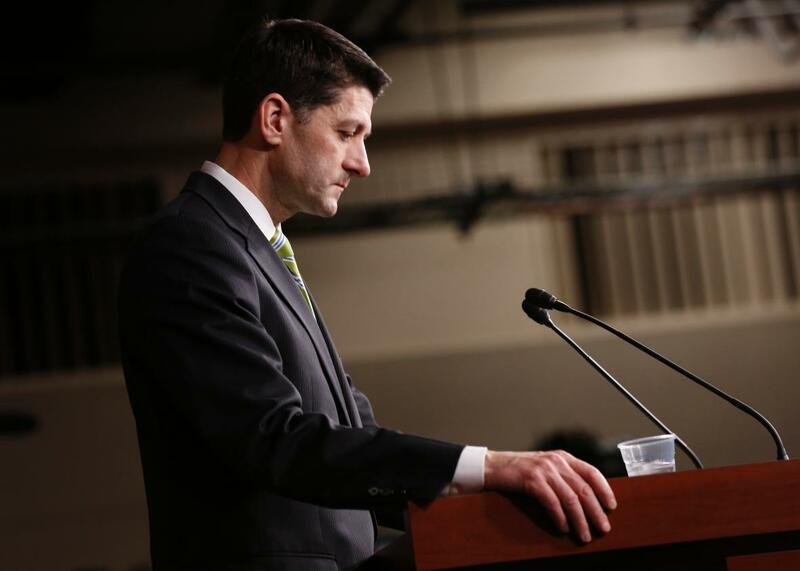 In Ryan’s first truly serious legislative test, the Freedom Caucus has killed his bill. Back in 2012, anti-tax lobbyist Grover Norquist summed up the prevailing sentiment among professional conservatives, when he said that it didn’t really matter who Republicans picked for president, so long as the party had Paul Ryan’s vision. “We don’t need a president to tell us in what direction to go. We know what direction to go. We want the Ryan budget,” he said. “We just need a president to sign this stuff. We don’t need someone to think it up or design it. The leadership now for the modern conservative movement for the next 20 years will be coming out of the House and the Senate.” Well, we know Donald Trump can sign stuff. It’s apparently Paul Ryan who can’t deliver on his end of the deal.